The compact Women and Leadership: History, Theories, and Case Studies, provides valuable research by experts on leadership and women's history to help students and citizens who want a more nuanced explanation of what we know about women as leaders and about how they have led in different fields, in different parts of the world, and in past centuries. Edited by: George R. Goethals, Crystal L. Hoyt. Goethals, George R., and Crystal L. Hoyt, eds. 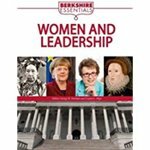 Women and Leadership: History, Theories, and Case Studies, Great Barrington, MA: Berkshire Publishing Group LLC, 2017.